It is a standardized method for team based problem solving that follows the PDCA (Plan, Do, Check, Act) cycle and that intends to capture all the most important information and thinking related to the problem solving process on one sheet of paper. 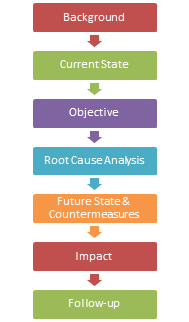 The steps of this method are: S1-Identify the problem, S2-Understand the current situation, S3-Develop the goal statement, S4-Perform root cause analysis, S5-Determine countermeasures, S6-Create a countermeasures implementation plan, S7-Check results and S8-Update standard work. An action plan is a guide outlining actions needed to reach one or more goals. • What needs to be done to achieve the objectives ? • Who is undertaking the individual tasks ? • When does the task need to be completed by ? It is essential that the plan has owners attributed to it, and the plan is bought off by its owners and the customers of the results. The plan should be reviewed on a regular basis. 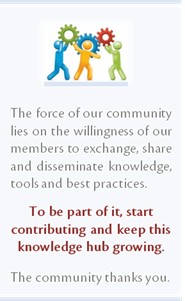 Useful links: "Action plan" by Business Dictionary.